Time in Peru works very flexibly. It is more of a vague idea than a fixed notion, and simple things such as buying bread can be complicated into hour long encounters which leave you wondering how you ever get anything done. Although I had stressed to the girls at LitClub that we were leaving at 3pm "en punto," it came as no surprise to me that they began to appear, ambling leisurely towards the library at 3.30pm – I myself hadn’t actually arrived until 3.15! 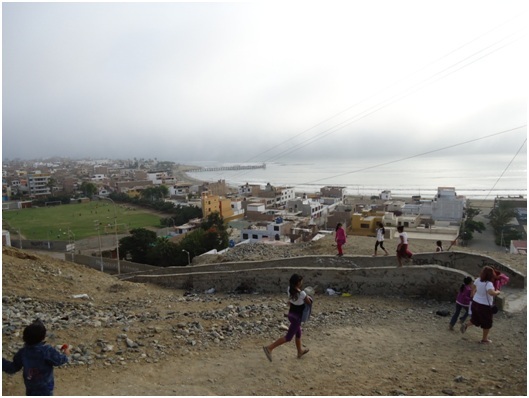 The plan for the afternoon was to walk down to Huanchaco to meet with a local restaurant owner at 4pm. The girls were to be given the chance to ask her questions about her family business before we went to the beach to interview a local surfer. However, as 4pm rapidly approached, Carmen and I were still running around Cerrito, tracking down missing girls, their parents and the odd elusive permission slip. When we finally began the walk to Huanchaco, an easy 15 minutes, it somehow stretched into an epic camino worthy of any adventure film as the girls just had to climb this wall or that tree. We arrived at the restaurant at 5pm. As we approached, I began frantically preparing apologies for the owner, but she welcomed us heartily with no thought or mention of our lateness. The girls listened politely and asked her very thoughtful questions about her life and her work. They loved the idea that she was an independent woman who ran her own business using skills she had learned from her mother and her grandmother as a young girl. After a wonderful time with Doña Mariela, we trekked onward to the beach. There can be no doubt that the highlight of the day was interviewing Faviola a local surf champion and student, who was excellent at answering the girls questions and giving them a little inspiration. As Faviola described how she had borrowed a friend’s old surf board while she worked to save up for her own, their eyes lit up with hope and possibility. 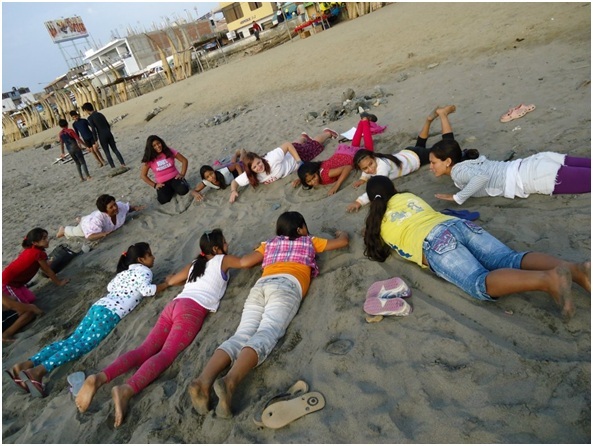 Many of the girls attend Otra Cosa’s surf school, which allows them to surf during the summer holidays, but during the rest of the year there is no opportunity for them to catch some waves. They loved the idea that they could work together to rent or borrow a surf board from a local surf school so that they could keep on surfing all year long. After a quick surf lesson from Faviola on the sand, we headed back to Doña Mariela’s for some delicious donuts with syrup before I hurriedly shepherded the girls back up to Cerrito. The girl’s excellent manners and thoughtful and insightful questions made me very proud to be working with them. The changes I have seen in them since the start of the LitWorld programme in terms of self-confidence and inquisitiveness have been magnificent to witness and it is such a pleasure to be involved in their journey.